Acriflex Cooling Burns Gel is perfect to apply to superficial burns which may occur in the home, sunburn and dry or irritated skin, to help you feel immediate cooling relief from pain. 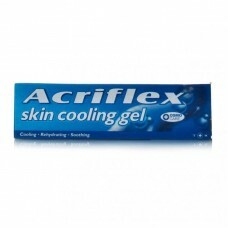 How to apply Acriflex Burns Gel: Adults and children should apply to unbroken skin and massage gently. Repeat 2-3 times daily. Acriflex Burns Gel contains: Glycerin, PEG-8, caprylyl glycol, sodium polyacrylate, carbomer, sodium hydroxide and purified water.